The use (and misuse) of dolls in magic and witchcraft is an ancient practice. These dolls all work on the same principle of Sympathetic Magic. Sympathetic Magic works on the principle that ‘invisible bonds connect all things’. It can be divided into two categories, Homeopathic Magick and Contagious Magick. The Scottish anthropologist Sir James G. Frazer first described these types in his book The Golden Bough (1890). Homeopathic Magick holds that “like attracts like.” A classic example of this type of magick is the melting of a waxen image of an enemy resulting in his or her death. 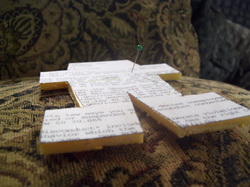 Contagious Magick holds that “things once in contact with one another continue to exert an influence on one another after they have been separated.” An example of Contagious Magick from a folk magick remedy to cure a wound would be to rub some medicine on the object which caused the wound in the first place. The most popular and well-known form of Sympathetic Magic is the use of poppets, or dolls. A doll can be made out of any number of materials from two twigs bound together and covered with Spanish Moss and wrapped in cloth, molded from wax or clay, or even from two pieces of cloth which have been sewn together and stuffed with cotton, moss, herbs, personal concerns, to name a few methods. These kinds of dolls are also great when you're dealing with a faceless institution such as your bank, school, or a government office. Just cut a paper poppet out of their correspondence to you and use it the same way you would use a doll to work on a specific person. 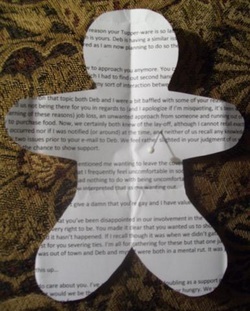 Paper poppets can be manipulated in ways that other dolls cannot. For example, one of my favorite banishing spells calls for making a paper-poppet of an individual and then tearing off a portion of the doll over 7 days as the moon wanes. The torn pieces are burned and the ashes scattered to the winds. In addition, paper-poppets can be rolled up and placed inside vials with a condition oil like Love Me Oil, or Just Judge Oil; or water such as War Water, Peace Water, etc.. depending on your purpose. To draw a lover, two dolls can be made to represent the interested parties. They can then be "glued" face together in the light of a fixed candle using honey as as an adhesive which serves to sweeten one to the other. The dolls can then be placed in an envelope with love-drawing and attraction herbs and placed under a burning candle, between your mattress and box-springs, or wrapped in your underwear in a drawer with your intimate apparel. A paper-poppet can be made of an enemy and placed inside a jar of vinegar or lemon juice to 'sour' their life. It can placed inside a freezer bag and placed in the freezer to cool a hot-temper or bind a person's negative behavior. The more heartless practitioner may place the paper-poppet in a jar of dirty water or moist earth. As nature breaks down the paper, the enemy is believed to sicken and die. If you plan on placing pins in the doll, it might be a good idea to line the back with one or two layers of duct tape so that the pins won't slip out of the doll. If you want to incorporate herbs, powders, etc.. into your work simply turn the doll over face down, sprinkle a bit of your herb or powder on it and then cover with tape. Turn the doll back over and trim the excess tape. Alternately you can glue the paper-poppet to a piece of Styrofoam like those used to sell pork-chops and other meats at the grocery store. Then use a penknife or box-cutter to trim the excess foam. Be sure to wash the Styrofoam off with warm, soapy water and allow it to completely dry before doing this. These are just a few ways in which the magickal practitioner can utilize these simple, easy-to-create dolls for use in the practice of magick and witchcraft. As you can see, their use is many-fold and you really are limited only by your imagination.